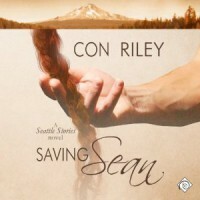 When I read the first in Con Riley’s Seattle Stories offering, After Ben, I so wanted Peter to find his own happily ever after. He is so personally devastated when Theo chooses Morgan, rather than finding Peter as his second chance at love following the death of his beloved Ben. So, I am pleased that Saving Sean offers the opportunity to see Peter let go of his lingering fascination with Theo, and find a true and lasting love of his own. At the urging of Theo, Peter grudgingly goes in search of Sean, the estranged brother of Maggie, Thoe’s dear friend who played a large role in Theo’s survival after Ben’s death. Peter finds Sean in the midst of trying to make sense of his recently deceased father’s home that is mostly full of legal documents that his father hoarded. Sean is lean and has long, red hair, and although he isn’t Peter’s usual “type,” he certainly triggers Peters need to nurture and take care of others.